1. Is the file name descriptive, and is the file in the .xlxs format? Instruction: Look at the filename in Windows Explorer OR the title bar in MS Excel. An example of a non-descriptive file name is "Document1". An example of a descriptive filename is "FY17 Grants Awarded by State" (Figure 1). The file must be in the "*.xlsx" format for accessibility testing to be possible. Test A: Is the filename descriptive and does it identify the document or its purpose? If not, the document fails this test. Test B: Is the file in "Excel Workbook (.xlsx)" format? If not, the document fails this test. A descriptive filename that identifies the document or its pupose helps everyone (including people with disabilities) locate, open, and switch between documents. In addition, the document must be in a ".xlsx" file format. 2. Are built-in features used to organize content? Test A: Does each sheet have a visual and/or logical reading order? If not, it fails this test. Test B: : Can the sheet be navigated using the up, down, right or left arrow keys, and does it match the visual/logical reading order? If not, it fails this test. Ensuring that each sheet has a visual and/or logical reading order helps assistive technology read content in an easy to understand manner. 3. Are link names descriptive? Test: Do links have meaningful names that describe their destination, function, and/or purpose OR are these determinable within context? If not, the worksheet fails this test. To edit the name of a link, select the hyperlink and edit the text in the formula bar. Note: deleting the last character in the link name will remove the link. To create a hyperlink in EXCEL, select the cell for the hyperlink and either click CTRL+K or use the Hyperlink button on the "Insert" ribbon menu and the hyperlink pane will open. Specify the text for the link and the destination information for the link. Click "Ok" and the link is created. 4. Is vital information in headers, footers, and watermarks duplicated in the document? Instruction: Look for vital information in headers, footers, and watermarks (e.g. Respond by X Date, CONFIDENTIAL, or Do Not Distribute). Test: Is the vital information duplicated near the beginning of the document? If not, the document fails this test. Assistive technology does not automatically read information in headers, footers, and watermarks, so you need to duplicate any vital information at or near the start of the related information. 5. 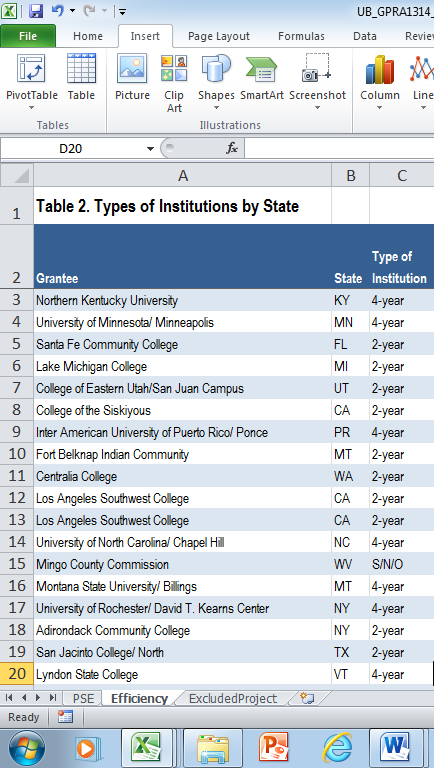 Did you use built-in features to create data tables? Instruction 1: Select a table and see if the "Picture Tools" shows up in the Ribbon instead of the "Table Tools" tab. If the "Picture Tools" tab shows up in the Ribbon, then it is a picture. Test A: Is the worksheet free of pictures of tables? If not, the document fails this test. Instruction 2: Place your cursor on a table cell and see if the worksheet is free of multi-level headings or any merged or split cells. If the "Merge & Center" tab shows up in the Ribbon, then it is a Merged or Split Cell. Test B: Is the worksheet free of merged or split cells? If not, the document fails this test. 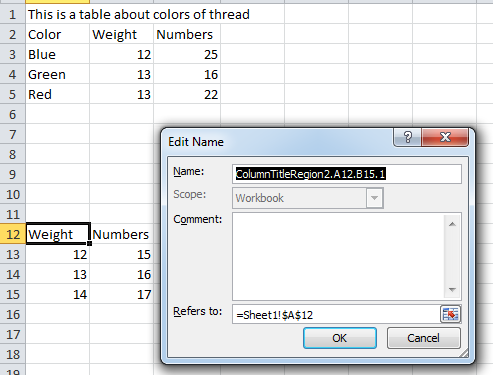 Instruction 3: Place your cursor on the first row and/or column of a table cell and see if the worksheet has identified the header row and/or column. If the "Name Manager" displays a Name then it has an identified header row and/or column. Test C: Does the worksheet identify the header row and/or column? If not, the document fails this test. Assistive technology users need to identify column headers in data tables so the user can understand the association between table cells and their respective headers. Select "Insert tab > Table." On the Insert tab, select "Table". In the Create Table dialog, select the "My table has headers" checkbox. Double click on the column headers and update the column header names to be descriptive. Insert the data into your worksheet. "Column Title[Name]..D10" and "=Sheet 1!$A$1", where A1 is substituted for the first cell of the table and D10 is substituted for the last cell of the table. "Row Title[Name]..D10" and "=Sheet1!$A$1", where A1 is substituted for the first cell of the table and D10 is substituted for the last cell of the table. For data tables with both one row and one column of headers: "Title[Name]..D10" is substituted for the last cell of the table. 6. Do images and other objects have alternative text? Instruction 1: Examine the surrounding text in cells (either before or after) for text that describes the object. Test A: Does the image/object/shape have descriptive text or an appedix? If not, the document fails this test. Screen readers cannot infer meaning from images and other objects. Images and other objects include pictures, images of text, images of tables, shapes, icons with hyperlinks, etc. Therefore, you must add descriptive text to images and other objects by putting information in surrounding text or in an appendix. 7. Are colors and other visual characteristics (such as size, shape, and location) that convey information also described in text? Using only color or other visual characteristics to convey meaning will not provide comparable access to people who are blind, have low vision, or are colorblind. Find where you have used color and/or other visual characteristics to convey meaning such as green, yellow, red, etc. Test: Is there text that conveys the meaning of the color or other visual characteristics? If not, the document fails this test. The following layout table describes the progress for three projects using colors to symbolize the current project status. Adding text in addition to the color provides comparable information to users of assistive technology and people who are colorblind. 8. Is the contrast ratio between text and background sufficient? NOTE: If the document text is black on white background (or close to it), you do not need to perform this test. This test requires Colour Contrast Analyser (an external application). Execute the Colour Contrast Analyser. Select "Download" (the application can be executed without downloading it onto your computer). Open the Colour Contrast Analyser. Drag the "Foreground eyedropper" icon over a sample of your text or image of text. Drag the "Background eyedropper" icon over a sample of your background color. 9. Are descriptions of embedded audio, video, and multimedia files accurate? Test A: Is there an accurate and complete text transcript for multimedia files, text description for audio files, and synchronized caption and/or audio description for video files? If not, the document fails this test. If you embed an audio-only, video-only, or multimedia file that contains meaningful information into your MS Excel document, you must also provide additional information so that individuals with disabilities have comparable access to the information. 10. Did you avoid forms while using MS Excel 2016? Instruction: Look for interactive Excel form fields. Ignore blank table fields, blank spaces, or underlines that users fill in text are not interactive Excel form fields. You are looking for the Excel built-in form features that are interactive and can collect data. These Excel form fields cannot be made accessible. Test A: Is the document free of all MS Excel form fields? If not, the document fails this test. Forms created in Excel cannot be made accessible for users of assistive technology and OMB certifications are likely required. 11. Did you exclude flashing objects? 12. Does the Excel need an alternative version? Federal agencies have the goal to produce one accessible document for everyone. However, there may be times when this is not feasible. Therefore, it is recommended that you contact the AT Team to ensure an alternative version is necessary as you are still required to create an alternative version that is accessible, up-to-date, and has equivalent content.